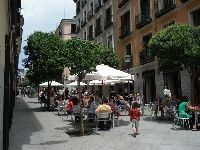 Once one of the most dangerous districts in Madrid, it has had a recent renaissance. Many new bars, small clubs and restaurants have opened lately, most of them around Plaza dos de Mayo, even though the whole district is full of small cafs and night-time attractions and it still manages to keep its alternative life-style. Situated near the central Gran Via its a good place for nightlife but not a very good residential area, except for students looking for the Madrid way of life. Here the buildings were built in the early 19th century and its small streets are often blocked with traffic.